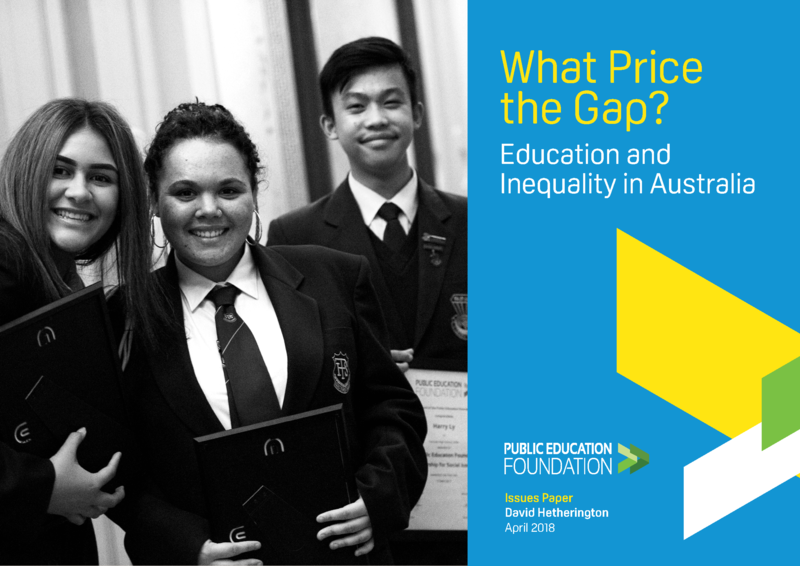 The Public Education Foundation’s new Issues Paper “What Price the Gap? Education and Inequality in Australia” reveals that growing educational inequality over the six years from 2009-2015 alone has cost Australia around $20.3 billion, equivalent to 1.2% of GDP. By charting the recent history of educational inequality, the paper evaluates the economic impacts of falling educational achievement as measured by PISA testing, including the value of the ‘inequality effect’ caused by a widening distribution of Australian students’ performances. We find that the total cost of Australia’s decline in educational performance over the 2009-15 is over $118 billion, of which $20.3 billion is the ‘inequality effect’. There are a range of recommendations to improve the performance of our lowest achieving students including targeted teaching approaches, alternative learning programs, second classroom teachers to support underperforming students outside the classroom, especially in disadvantaged communities and keeping some spots in selective school for comprehensive students, and a firm commitment to needs-based funding for schools.